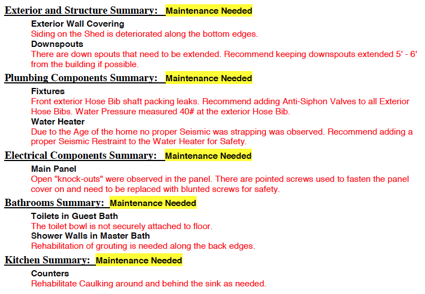 This is what a home inspection report looks like, at least in part. I represented buyers on the purchase of a home in Sequim, and this is the summary of the home inspection report showing the main issues. On this home inspection report the issues are all relatively minor, including items like some minor siding issue on the shed adjacent to the house, the down spouts needed to be extended a few inches, a hose bib was leaking, the electric panel cover needed a couple of shorter screws, a new toilet needed to be tightened to the floor, and a little tile caulking was needed. All of that was pretty easy to fix, and the seller readily agreed to repair these items at my client’s request. The home inspection report also discovered a faulty sump pump that needed repair. Fortunately, the sellers agreed to take care of that. In some areas in Sequim, the water table is high, and a sump pump must be installed in a hole in the crawl space to keep water from building up in the crawl space during the three months of the winter when the water table is at its highest. I also attended the septic inspection for my buyers, and when the inspector took the lid off the tank that holds the liquids, it was full to the brim with water. No one had been living in the home, and apparently the septic pump was not working. During some rehab work, the seller’s contractor had torn out what he thought was an extraneous conduit pipe. Unbeknownst to him, that conduit held the wire carrying electricity to the septic pump. The seller agreed to repair this for the buyers. This is why the home inspection report and the septic inspection report are so important for a buyer. For more, read a series of articles about the Home Inspection Report. One Response for "The Home Inspection Report"